The premium option; the budget choice; the all-rounder. Plus: random orbital vs belt sanders. If you've ever attempted to sand a woodworking piece by hand, you are aware of how time consuming the process is. Even if you own an electric power sander, you may spend a chunk of time and energy working - only to end up with rough swirled patterns. To prevent this, you should use a random orbital sander. As suggested in the name, random orbital sanders move at random to prevent swirling. To assist you to discover the ideal sander, we researched several top selling models. You will find them in the reviews at the end of this article. Before we start, let's help you decide on the best sander to fit your needs. When it comes to choosing the proper sanders for your tasks, options are vast. One of the top alternatives compared to random orbital sanders are belt sanders. An orbital sander is light, simple to maneuver single-handedly, and quiet. Additionally, it is very difficult to damage your woodworking with this sander. But, while it is safer, an orbital sander isn't that helpful for the removal of heavier stock. These tools are generally for the sanding of smoother wood. Other uses include rounding sharp edges, sanding hardened putty, and cutting dried paint. Orbital options are sometimes referred to as quarter-sheet orbital sanders. This is because they take a quarter sheet of 9x11-inch standard sized paper. Two spring clamps hold this paper against the pad surface. The pad has circular vibrations, or pits, allowing sanding in many directions. Random orbit sanders fall between belt sanders and orbital powered finishing sanders. It's simple to confuse orbital sanders and finishing sanders. The names are similar, and they share common layouts. They have compact housings and curved palm gripping tops. But, an orbital sander provides a square sanding area, and random orbital finishing sanders have round pads. This single variation can make all the difference, though. The rounded pad on random orbital sanders moves at random. This means that it rotates in small circles, but also spins in a circular fashion in tandem. Due to this, this single small tool can work for both wood surface removal and smooth sanding. Since the pad spins and vibrates at the same time, it eliminates swirls that usually stay behind. An orbital sander will not cut wood as fast as belt sanders. Also, it is harder to control than a finishing sander. However, the random orbital sander is the most versatile portable sander you will own. Finally, some random orbital sanders take peel-and-stick disks, while others use Velcro. Peel and stick discs are less costly, but hook-and-loop disks are a lot quicker and easier to reuse and change. Orbital Sanders have round pads of either 5 or 6 inches which move in a circle. The mat attaches to an offset bearing, providing random patterns for movement. This movement lets the worker move the sander any direction without marring surfaces. Some random orbital sanders have variable speed controls. This allows the operator to customize the instrument to the substance. Random sanders need special sanding sheets which vary between manufacturers. For the dust removal system to work, the holes in the paper and the mat must line up. When getting an orbital sander, you should look at both the feel of the device in your hand, and the vibration power. Manufacturers are introducing low vibration options of their products as of late. A primary point to educate yourself on is the variable rate option. Many have asked why variable rate random orbit sanders beat out one speed units costing less. Generally, this is for better control and a stronger sensation on softer wood. Also, variable rates provide better reactions on delicate surfaces. The important thing here is random orbit sanders can do more with varying rate. While most single rate sanders are 10 to 12 thousand rpm, variable rate sanders are from 4 to 12 thousand. While single rate sanders work for general tasks, variable options are finishing beasts. The ideal rate range for finish sanding is from 6 to 10 thousand rpm, while the range for polishing is 4 to 6 thousand rpm. As there is more control over completed projects, we recommend variable speed options. The strongest product in testimonials for random orbital sanders is the Bosch 1250DEVS. 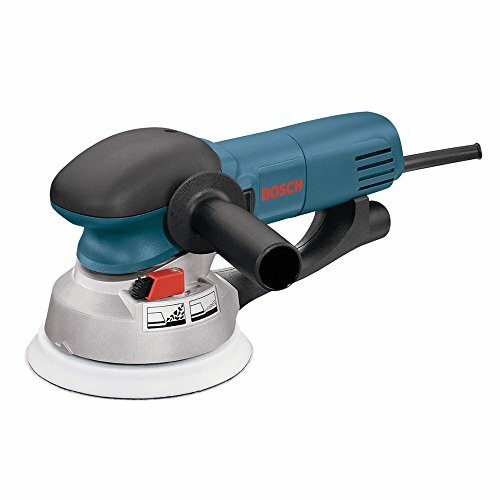 This sander is large, with great versatility. Its speeds are variable, and range from 3,100 to 6,500 rpm. When sanding at high speeds, you can sand worry-free with little dust issues. The Bosch model comes with a vacuum seal attachment to prevent this. Bosch provides a single-year warranty for this, so repairs and returns are a breeze. The sander's versatility comes from its speed rate and design. As it is larger, it is also quite heavy compared to alternatives. Yet, there are many ways to hold the Bosch sander for your comfort. The product includes an extra handle for each side of the tool. This makes it comfortable for both left handed and right handed woodworkers. You can use these handles when working on larger jobs requiring a good bit of speed and power. Or, take advantage of the palm grip, for work with more delicacy and detail. 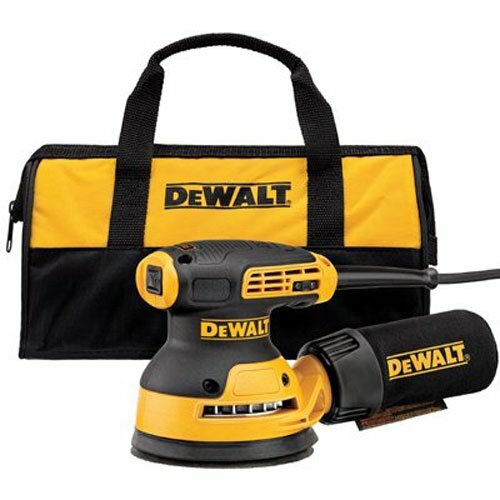 When looking to buy a quality random orbital sander, DeWalt's DWE6423K is a good budget option. This less expensive selection is great for anyone foraying into woodworking. It's also good for smaller do-it-yourself jobs around the house. Not only is this product inexpensive, it is also feature-rich. A few of the features on the DeWalt DWE6423K are comparable to orbital sanders triple the price. The sanding disc is five inches in diameter. This makes it great for mid size to larger sanding jobs. It has a motor power of three amps, and a variable rotation rate of 8 to 12 thousand RPM. While at work, the included dust bag assists in maintaining a clean working area. When sanders work at higher rates of speed over rougher pieces of wood, vibrations occur. These vibrations can make if difficult to control the orbital sander. These vibrations can also cause wear and tear to the sander itself. The DeWalt option takes away some of the most powerful vibrations. This makes it easier to get more work done, and assists in preventing exhaustion. If you are planning on utilizing this sander for a long time, the seven-year guarantee is a game changer. This allows you to maintain your device far longer than most orbital sanders. The Porter Cable 7346SP delivers flexibility, and is a must in our list of random orbital sanders. The flexibility in this product is due in part to its versatility. Not only will this sander do well for wood projects, but also other functions as well. Polishing pad adapters make the 7346SP ideal for boat and car based paint projects. This includes such tasks as waxing, compounding, cutting, buffing and polishing. If you aren't in need of a side handle for better grip, it is removable to focus on the palm grip. The polishing pad is perfect for providing a streak free shine to your car's paint finish. This versatility and interchangeability is unheard of with most orbital sanders. But don't confuse the sanding disc with the polishing pad! The Porter Cable 7346SP provides 4.5 amps of power and a slower, more methodical rate of 2,500 to 6,800 RPM. This sander does not include a dust collection method, so your workspace might get dusty fast. Make sure to wear a mask while working with this device on wood and you should be fine. The included three-year warranty is an added bonus to this already-versatile tool. Disc Size: Our random orbital sander reviews comprise several different disc size choices. Larger discs are fantastic for bigger surface locations. If you're working with a smaller or more detailed piece of wood, then you need to pick a smaller disc. Motor Power: Motor power makes a significant difference. It’s an intelligent move to find a random orbital sander with loads of electricity (measured in Amp). This ensures your sander can handle any kind of project, including tougher ones. Variable Speed: Many our random orbital sander reviews are variable rate sanders. This feature provides you more control over the spinning rate. You can fix it from slow (for details) to fast (to get tasks done in a flash). Orbit Speed: The orbit speed of your sander is particularly important if it does not change. Slower sanders do better work on small, detailed projects. If you're looking to remove plenty of wood, then a faster orbit speed is terrific. Dust Control: Sanding creates plenty of dust, especially when sanding with a good bit of power. To keep from breathing it in, you should look for an orbital sander with a dust collecting bag or canister. Warranty: Random orbital sanders can take a lot of abuse if you're often using them for heavy sanding. Warranties will help you save money if you ever need parts or a sander replacement. Some companies offer longer warranties than others. In conclusion, there are plenty of things to look for when purchasing a random orbital sander. With the above considerations in mind, you’ll be able to find the right sander for the job. Look through the top three recommendations we have suggested and see if one of them fits your needs. They made the list as they come from trusted manufacturers. They also feature a lot of bang for your buck—and reviewers agree! Above all, if you have the chance, try one out for yourself and see how it feels in your hands. At the end of the day, you have to be comfortable and happy with the tool you choose. That final part of your decision will come down to personal preference.